The Learning Lounge is focusing its attention on careers this year. Every two months we will be putting a new career into our spotlight. 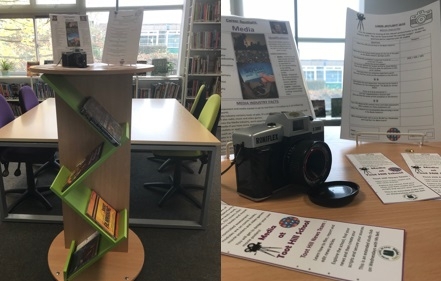 On our career spotlight display, you will find books on a chosen industry, quizzes, career profiles, informative posters and bookmarks which detail the subjects on offer at Toot Hill School which will help you on your way. Our display is not just for those students immediately thinking about their future, it's for those who are considering their options in Year 9. Our career spotlight can help you determine which GCSE's will be important to your future. If the Media Industry is not for you, you can still explore our display and take part in our fun quiz to earn 10 credit points. Stay tuned, as later on in the year, we will have guest speakers visiting us, to talk to you! Interpreters/ translators is one of the quickest growing professions in media with an expected 18% growth in the next 10 years. This job could earn you £36,000 a year.